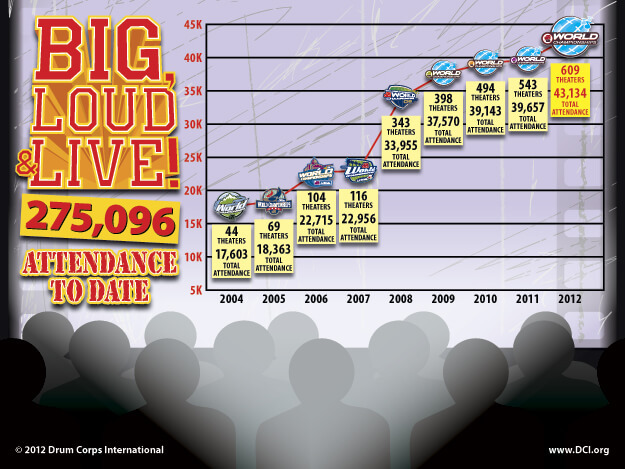 The "Big, Loud & Live 9" movie theater broadcast of the 2012 Drum Corps International World Championship Prelims on Aug. 9, established a new milestone with a nearly 9 percent increase in attendance over the previous record set in 2011. Eclipsing 40,000 in attendance for the first time, the program was carried in 609 theaters throughout the United States, up from 543 in 2011. "Since the debut of the program in 2004 on just 44 screens, we're proud to have grown the attendance of 'Big, Loud & Live' each year," DCI Executive Director Dan Acheson said. "After nine years we can boast that we've exceeded a quarter-million spectators who've experienced the thrill of the World Championships in movie theaters." The 43,134 in attendance at "Big, Loud & Live 9" adds to 6,647 who saw the event live at Lucas Oil Stadium in Indianapolis, setting a high-water mark for the total number of spectators who have experienced a single Drum Corps International competitive event. 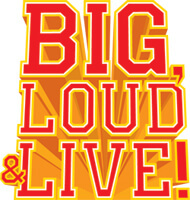 Big, Loud & Live move theater attendance 2004-2012. Earlier in the summer, Drum Corps International also saw an increase in attendance at its "Tour Premiere" movie theater broadcast. Making its debut in 2011, this year's edition featured the season-opening performances of the Blue Stars, Phantom Regiment, Carolina Crown, Cavaliers, Cadets and Bluecoats taped in Akron, Ohio. The event brought 23,998 spectators into movie theaters on June 18, an increase from 2011 when 23,044 attended. "We're looking forward to continue to work with our partners at Fathom Events to develop opportunities to expose an even greater number of people to the remarkable performances of the world's most elite marching music ensembles," Acheson added.